Bungie’s fall expansion for Destiny will arrive bearing the title Rise of Iron, a leaked poster has revealed. 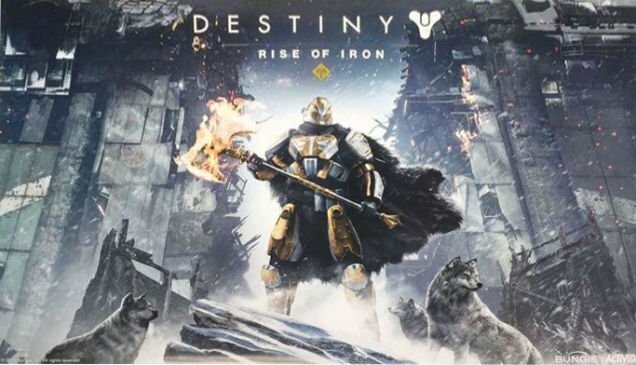 First spotted by Kotaku, the still image showcases Iron Banner boss Lord Saladin front and center, breaking through what looks to be the towering Cosmodrome wall located on Earth. After dealing with Oryx and the Taken menace last year, could Bungie be circling the action back to Earth and the Traveller? Time will tell. At the time of writing, there are precious few details relating to Destiny‘s fall expansion; all we know for sure is that it’ll land around the same time as last year’s The Taken King (read: September) bringing with it a new raid – one said to be based on the raid mission cut from the shooter’s first expansion, House of Wolves. It’s a slot that was once occupied by Destiny 2, before a sizeable overhaul by Bungie and Activision pushed the confirmed sci-fi sequel into 2017, allowing for this new content drop to take its place in September of 2016. Bungie didn’t issue a comment to confirm or deny Kotaku’s report, though given how the setting and character featured in the image aligns with previous reports – not to mention the Bungie/Activision watermark – it looks all but set that Destiny players will be chronicling the Rise of Iron come September. Expect official details to emerge during E3 next month.